You can make this "wilted" or not, however you prefer. Optional additions include chopped tomatoes, green onions, sliced mushrooms, or cooked bacon bits. Put seeds in large pan over medium-high heat. Shake pan often until seeds are lightly browned (5 minutes or so). Pour from pan and set aside. Mix vinegar, sugar, and soy sauce; set aside. In pan over medium heat, combine sesame oil and garlic. Saute until golden (about 4 minutes or less -- do not scorch! warns Mom). If you want your spinach wilted, add it here and stir over high heat until it's just wilted -- "the way you prefer." If you don't want it wilted, pour the garlic mixture into a large bowl, then add the raw spinach and stir it up good. 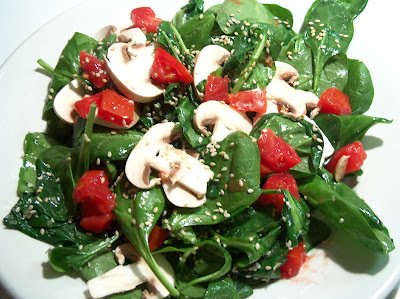 Transfer spinach onto plates, sprinkle with sesame seeds (and any of the optional tomatoes, mushrooms, etc. ), and drizzle with the vinegar-soy mixture. Yum. Anyone else have good salad ideas? This Bread Crumb Omelet is the perfect simple supper for when you have almost no food in the house. It is simply delicious as described here, with just garlicky-browned breadcrumbs and Cheddar cheese. (I whirl a piece of bread in the blender to get my breadcrumbs.) If you have leftover bits of meat, seafood, or vegetables in the fridge, you can add those, too. But no need. Here, then, is the recipe, which is based on a recipe from the book In Madeleine's Kitchen by Madeleine Kamman. Mix egg with garlic in small bowl. Set aside. In small non-stick skillet, place bread crumbs and butter. Over medium heat, brown bread crumbs. When crumbs are golden, WORKING QUICKLY, pour egg mixture over, sprinkle with pinch of salt, and STIR once or twice. (If you don't stir right away, you'll end up with scrambled eggs.) When omelet is about cooked -- maybe 30 seconds or so -- add the cheese and anything else you want. Roll and place on a small plate. Yummy. And garlicky. You may need breath mints later. Note that it's made of only one egg, so be prepared to make as many as you need to fill up yourself and whatever other stomachs you're responsible to feed. When you add fruit, a salad, roll, it's dinner. The cucumbers keep coming. Alas, so must the recipes. This one, based on a recipe from the book The Frugal Gourmet, "will become a family favorite, I promise!" 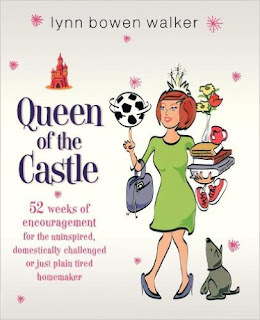 says book's author Jeff Smith. Prepare the cucumber and onion and combine in a bowl. Set aside. Put sugar, water, vinegar, and dill in small saucepan. Bring to a boil. Pour liquid over vegetables, stir gently, and refrigerate until you're ready to eat. Remember the old commercial, "Candy coated popcorn, peanuts and a prize"? That's what you get with this quite Cracker-Jackian recipe for Baked Candied Popcorn. Make the pocorn and plop it into the largest bowl you own, picking out any unpopped kernels as you go. Add the peanuts. Melt butter in medium saucepan over low heat. Stir in molasses and honey and cook over high heat, stirring, until bubbles start to form, which will take only a couple minutes. Pour over popcorn/peanuts, stir as well as you can to coat the popcorn as evenly as possible, then put entire bowlful on a large cookie sheet. Bake at 350 degrees, stirring often, for about 8 minutes. Hint: Stay in kitchen during baking period as going outside to cut flowers from garden may result in several scary-dark popcorn kernels. Eat immediately, or bag up to bring to local high school football game along with ski parkas and blankets. Alternately, squish into the corner of sofa and enjoy popcorn while watching World Series baseball games, Dancing With the Stars, or Survivor -- take your pick. Do you have a nimiety of garden cucumbers this time of year? (Nimiety: excess; overabundance) Try making these pickles. No canning involved, just some slicing and dicing. (A food processor is highly recommended to get the cukes thin enough -- 1/16th of an inch). The finished product should keep about three weeks in your refrigerator. Combine cut up vegetables in large bowl. Sprinkle with salt and celery seed, stir gently, and set aside for one hour. Mix together sugar and vinegar until sugar is dissolved. Pour over the vegetables and refrigerate. Done! These will be best after a day or so and will keep for three weeks. 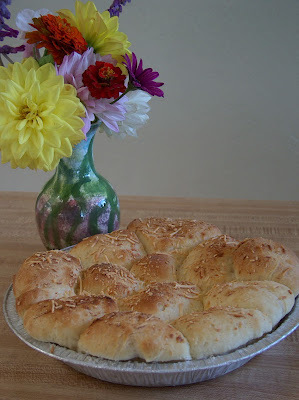 I promised I'd share my occasional recipe flop on this blog, too. I give you Exhibit A: Pistachio cookies, recipe originating in the Middle East. No need for me to share the instructions here. Suffice it to say, if you'd like to replicate the taste yourself, just bite into the nearest wall and savor the plaster dust. Wash potatoes and cut into quarters to make wedges. Put in large bowl. 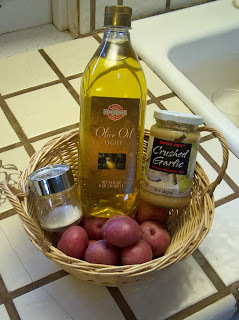 In measuring cup, mix olive oil and garlic; pour over potatoes and mix well. Sprinkle with salt to taste. Put into baking dish and bake at 450 degrees about 45 minutes, until potatoes are done and browned. If desired, stir once or twice during baking for more even browning. Note: When I made these last, I baked them at 325 degrees since I was cooking a pork roast at the same time. They were done in an hour, but were not as brown and crispy as usual. The point being, if you're baking something else anyway, a lower temperature works fine. Another note: I have no idea how many servings a pound of potatoes should make, but two of us ate this whole recipe, no problem. The point here being, if you like potatoes or are serving more than two, you might want to at least double the recipe. Why is the cookie jar only half full, you ask? Well . . . er . . . we like cookies around here. This recipe is almost identical to a regular chocolate chip cookie recipe, only it adds unsweetened chocolate and a little extra sugar. 'Cause can you have too much chocolate? I think not. Heat oven to 375 degrees; grease cookie sheets. In large bowl, cream together butter, brown sugar, sugar, eggs, and vanilla. (You can use electric mixer, if you want; I use a pastry blender.) Add melted unsweetened chocolate and mix well. Stir in flour, baking soda, and salt. Add chocolate chips (and walnuts, if you use them). Using a large spoon or a round ice cream scooper, scoop a big blob of dough onto cookie sheets. Bake about 10 minutes. Once they're slightly cooled, eat 'em up. See the peaches on our peach tree? Take 15-oz. can sliced peaches packed in fruit juice. Put it in the freezer around lunchtime. Around dinnertime, open the can and dump the contents into a blender. Whirl until slushy. Makes two drinks. Are you getting your five servings of fruits or vegetables a day? Me neither. But don't despair. Authors of the book 5 a Day: The Better Health Cookbook, Dr. Elizabeth Pivonka and Barbara Berry, suggest you can start slow. ". . . Just try to beat the number of servings you had the day before." And you might be surprised. 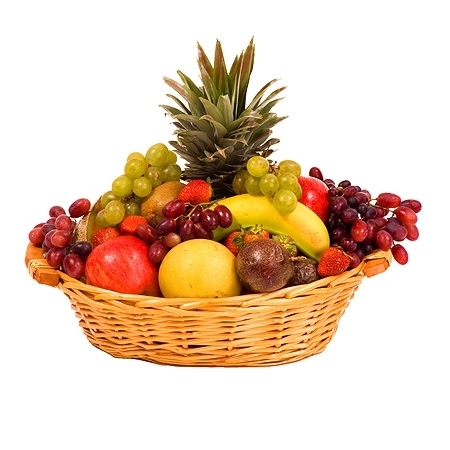 A serving is not only one medium-sized piece of fruit, it can also be 3/4 c. fruit or vegetable juice, 1/4 c. dried fruit, or 1/2 c. frozen or canned vegetables or fruit. So that smoothie you whipped up for an afternoon snack? Totally counts.
. . . other than candy corn, that is.